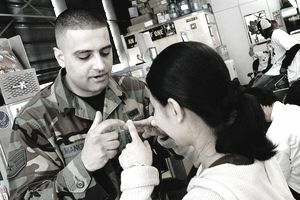 To help address personnel needs in certain areas, the Air Force and other branches of the U.S. military offer a variety of enlistment bonuses at any given time. Like the other military branches, the Air Force offers financial incentives for applicants without prior service who enlist in designated shortage Air Force Specialty Code (AFSC) jobs. This means that whether or not you've served in the Air Force previously, signing up may come with a monetary perk. These bonuses can be anywhere from a few hundred to several thousand dollars. If a bonus is given, the amount disbursed ultimately depends on an individual's career field. The Air Force Specialty Stress List, which is updated every quarter, details the latest career fields that are regularly undermanned. A job isn't necessarily on this list because it's unpopular (although sometimes it is), but can be due to a lack of skilled personnel, or the amount of time airmen spend on active duty, and the tempo of current operations. Sometimes a job is so new that the demand may be immediate, but the number of people filling the job is still small. One field that is perennially depleted is maintenance. As the Air Force puts it, there's always a need for people who "turn wrenches," that is, who work on aircraft to keep them in top condition. While most enlistment bonuses come in the form of cold, hard cash, there are a few other varieties of incentives the Air Force may offer new recruits, including student loan repayment, voluntary education programs, and benefits of the G.I. Bill. For some seriously stressed jobs, there may be a combination of incentives to get enlistees to sign up. In order to be eligible for these incentives, candidates must be in Air Force Qualification Test (AFQT) category I, II, or III. They must also earn an Armed Forces Qualification Test (AFQT) score of 31 or higher on the Armed Services Vocational Aptitude Battery (ASVAB) and enlist and serve in an Initial Enlistment Bonus (IEB) specialty area. Enlistment bonuses are subject to change without notice, based on the current needs of the Air Force. So, for the latest information contact your local Air Force recruiter. The Air Force usually pays enlistment bonuses in a single lump sum, after completion of technical training and arrival at the first duty station (usually within 90 days of arrival). Enlistment bonuses are subject to federal and state taxes. So calculate the actual amount of your bonus before you go spending it. The net amount may be slightly less than you're expecting. Be advised that many (but not all) military enlistment bonuses require a longer tour of duty than the normal four-year enlistment. So before you sign up, weigh whether the short-term reward is worth the longer commitment of your time. If you were planning to join the Air Force anyway, it may be the boost you need.